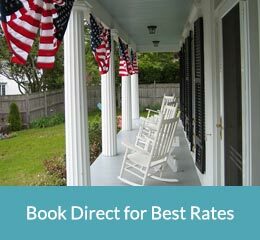 "The heart can think of no devotion greater than being shore to the ocean"
Located in Yarmouth Port, MA, Liberty Hill Inn is one of the top bed & breakfasts in the USA. We invite you to stay with us, relax and enjoy the Cape Cod experience. The Liberty Hill Inn’s main house accommodates five spacious rooms, from the ground floor to the third floor. All rooms have private baths, new quiet air-conditioning units, and TVs. Wi-Fi is accessible on the entire property, and free on-site parking is included with your stay.